Best Outdoor Pizza Oven: Mouth-Watering Al-Fresco Pizza! If you’ve tried to make pizza in a traditional home oven, you know it can be good, but it’s just not the same as you get from a restaurant. The max temperature a standard kitchen oven gets to is maybe 550′, while pizza needs at least 700′, and ideally as much as 900′ to get that perfect cook. So if you want the perfect pizza, you’ll need an outdoor pizza oven! These ovens can get very hot, and are a great solution to making pizza, and are a whole lot of fun. After a thorough look at the market, we have found that the best outdoor pizza oven is the Uuni 3 Portable Wood Pellet Pizza Oven. The Uuni pizza oven is one of the fastest to heat up and cook, and can reach temperatures of 900’+! It also looks stunning and is reasonably priced. What more could you want from an outdoor pizza oven? For a complete review of the Uuni Pizza Oven, see our Product Reviews section below. If you don’t love the Uuni 3 pizza oven for one reason or another, you should certainly check out the Camp Chef Italia Artisan Pizza Oven. It looks really great and heats up incredibly quickly. Rather than use wood pellets to fuel the fire, this pizza oven uses propane, so is slightly less eco-friendly than the Uuni model, though fuel is easier to source. It doesn’t get quite as hot, though. The design of the Uuni is a little cooler, but if you prefer working with Propane, you’ll love the Camp Chef Italia! For a complete review, see our Product Reviews section below. For those of you looking for the capabilities of an outdoor pizza oven, but don’t want to spend a fortune, be sure to check out the Pizzacraft Pizzeria Pronto Outdoor Pizza Oven. Pizzacraft Pronto Outdoor Pizza Oven with Brush and Peel. eBook Included! It’s ideal for transporting around, works really well, and is surprisingly light on the wallet. For a complete review of the Pizzeria Pronto, see below. In this section, we will look closely at five of our favorite outdoor pizza ovens. We consider the positives and negatives of each, compare them, and pick our favorites. The Uuni 3 Portable Wood Pellet Pizza Oven looks like a space robot, but man can it cook a mean pizza in style! This oven looks so space age its use isn’t even really apparent from a quick view, and its design is so striking it’s sure to be a conversation starter from the moment you reveal it. The Uuni works using wood pellets and can hit temperatures above 900′ F, so you can be certain you’ll get perfect pizzas out of this baby. Impress your guests this summer by cooking a delicious wood-fired pizza in just 60 seconds with this fantastic outdoor pizza oven on offer from Uuni. Made of high-quality stainless steel, not only does it look smooth and sleek but it also performs really well. Reaching temperatures of up to 932° this pizza oven has amazing capabilities. There are no adjustments to temperature: just get it as hot as you can, and keep it there. It will be ready to go in just 10 minutes and will cook your favorite treat to perfection in no time at all. Running on wood pellets (such as these Cookinpellets), this Uuni 3 Portable Pizza Oven is both eco-friendly and inexpensive to run. You also get the authentic taste of eating a pizza that’s been cooked in an outdoor wood-fired oven. With the Uuni, you can make pizzas up to 13″ in diameter. Everything you need to get cooking comes included in the package, and setup is a cinch. There’s no reason why you can’t have this assembled in 10 minutes. Don’t forget store this in a shed, or garage where it is protected from the elements. If you can’t do that, pick up a cover for this one, as you don’t want the weather to ruin it! All in all the Uuni 3 Portable Pizza Oven is an excellent buy. It looks incredibly cool, it’s made of high-quality materials, and it functions really well too. Being able to heat up and cook a pizza from scratch in around 12 minutes is also a huge bonus. Set up is simple thanks to the nice and clear instruction manual, and running on wood pellets, the Uuni 3 is eco-friendly too. All the wood used in the pellets has been responsibly sourced and the company even pledges to plant one tree for every 3 bags of Uuni pellets that are sold. For all of those reasons and many, many more, it’s clear to us that this is by far the best pizza oven out there at the moment. The Blackstone Outdoor Pizza Oven is a very simple, cool pizza oven. It features a fairly traditional look and doesn’t really stray too far from the gas grill shape, but it still has some nice design features, like the two-tone black/stainless color scheme. This pizza oven features a rotating pizza stone and is powered by propane. It can reach temperatures of up to 1,000′, so you can achieve those needed temperatures for the perfect pizza! If you’ve got a need for speed when it comes to making great food, then feast your eyes on this fabulous outdoor pizza oven on offer from Blackstone. The manufacturers claim that it cooks twice as fast as any other pizza oven out there. And so with this beast, you can enjoy a fully cooked pizza in under 3 minutes! If you’re having a garden party, you can crank out the pies in no time! Another great benefit of this machine is that it offers easy ignition. There’s no need to mess around with charcoal and matches. Simply attach the gas, hit the push-button ignition, and away you go. You’re cooking with gas! You can cook pizzas up to 16 inches in size with this oven. And to ensure all your pizzas are of the best quality and cooked evenly, the rotisserie motor rotates the pie as it cooks. Be sure to grab the Blackstone Pizza Oven Cover to protect your investment from the elements. The fact this pizza oven can cook a tasty, fully cooked pizza in less than 5 minutes is truly amazing. Being made from brushed stainless steel, it’s easy to clean and certainly looks the part too. The Blackstone Pizza Oven of a really good size and the price is pretty average for a decent pizza oven. But, where this model is lacking in comparison to the Uuni 3 Portable Pizza Oven is the quality. Some of the parts are a bit flimsy and could break if not careful. While it’s a really great benefit being able to cook a large pizza quite fast, it’s not very good if you have to sacrifice on quality. And for the amount you’d pay for this pizza oven, there are far better-performing models out there. The PC6000 Pizzeria Pronto Outdoor Pizza oven by Pizzacraft is a super cool compact outdoor pizza oven that hews toward a more traditional design but makes a fantastic pizza in a small footprint. Capable of reaching temperatures of up to 700′, this oven is a bit lower in terms of temperature than some of the other ones on our list. However, it can make a mean pie nonetheless, and we love that it’s so easily portable! If you’re looking for a pizza oven that’s portable, well-priced, and perfect for those family and friend get-togethers, be sure to check out this outdoor pizza oven on offer from Pizzacraft. Using propane as fuel, this pizza oven is ready to go in around 10 minutes. You can literally watch the temperature to soar to a firey 700° F right in front of you. Then from there, it will cook your pizza to perfection in just 5 mouth-watering minutes. To help prevent sogginess when cooking, this machine has a built-in moisture vent located at the top of the oven, and its dual layer structure helps to ensure you only get evenly baked goods too. It’s also really easy to assemble. The Pizza Stone in this unit is 14″ diameter, so figure you’ll be making about 12″ diameter pizzas — definitely a bit smaller than many of the other outdoor pizza makers on our list today. There’s barely anything to put together, and can be ready to use in less than 5 minutes. Also available is a stand for the Pizzeria Pronto if you don’t want to use up valuable table space, and a protective cover that you should be sure to use! Never again will you want to order pizza again with one of these in the outdoor kitchen. There are so many great points about this machine, it’s hard to know where to start. It looks good, functions well, and its compact design makes it ideal for transporting around to a campsite, picnic, or neighboring backyard. Assembly is easy, and best of all it’s very well priced. And for those reasons and several more, we’ve given the Pizzacraft Pizzeria Pronto Outdoor Pizza Oven the title of the best budget model. It doesn’t look anywhere near as cool as the Uuni, and it can only cook slightly pizzas. It is also unable to reach the high temperatures of the Uuni or some of the other models on our list. The fact that it uses propane means that fuel is easy to acquire, and it really does make a good pizza. And at the price it’s positioned, the Pizzeria Pronto is a great offering. For these reasons, it’s our budget choice. Reaches cooking temperatures of 700F. Preheats in only 10 minutes. The Camp Chef Italia artisan pizza oven is a beautiful outdoor pizza oven with an all stainless finish and some serious cooking capabilities. This unit can reach temperatures of up to 700′, which is a little lower than some of the other ovens on our list, but still more than capable of making fantastic pizza. If you’re looking for both style and functionality, cast your eye over this beauty. Made from sleek stainless steel with a graceful arched top, the Camp Chef Italia Artisan pizza oven is one elegant, smooth looking machine that will look great in any outdoor area. The way it’s been designed, it cooks just as a brick oven, but without all the fuss. Simply preheat the pizza oven for around 15 minutes, and pop in a pizza. Within just a few minutes, you’ll have a fresh, mouth-watering pizza to enjoy! To give you more control over your cooking, there’s even a built-in micro-adjust valve to allow easy control of the flame. There’s also an integrated temperature gauge that allows you to keep an eye on the core temperature of the machine to make sure you’re not veering too far off in any direction. The Camp Chef Italia comes with a rectangular pizza stone that is about 20″ x 13″, so you can make a larger oblong pizza, or make multiple smaller personal pies at once. You can run the oven straight off a disposable propane bottle for easy convenience, or hook it up to a standard 5-gallon propane tank for a more permanent solution. To store, be sure you pick up the protective cover unless you have a place to put it that is completely sheltered. 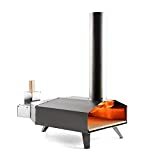 The Camp Chef Italia is a really cool looking pizza oven that is very much evocative of traditional brick oven shape but with a modern twist. It’s sleek and quite compact. But don’t let that put you off as it still packs quite a punch. With an oven that reaches temperatures of around 700°, a double layered ceiling to improve the cooking functionality, and the choice of using a portable or more permanent propane bottle there’s really not much to like with the Camp Chef Italia Artisan Pizza Oven and that’s why we’ve made it our runner-up. The Camp Chef Italia is a great choice for those who want to stick with propane, but it is edged out by the Uuni 3 with its wood pellets. If you’re willing to deal with the hassle/fun of wood pellets, the Uuni is better designed, cooks hotter, and is overall a cooler outdoor pizza oven. However, the Camp Chef Italia is an excellent option as well and is our runner-up pick. Total Output: 17,000 BTU/hr - Weight: 47 lbs. The ilFornino Professional Series wood-fired pizza oven is absolutely stunning, with an all-stainless steel body, and a look that feels a bit closer to a traditional smoker than many of the other pizza ovens on our list. Capable of hitting temperatures of 900’+, this huge, hefty wood-fired pizza oven is a great choice for those who want a sizable, seriously designed gourmet pizza oven for the yard. It has a huge cooking area, and can realistically cook two 12″ pizzas at a time. Hold on to your chef hats and prepare to be amazed by this fantastic professional pizza oven on offer from ilFornino. Not an oven (or a price!) for the faint-hearted, this pizza oven is definitely one of the more expensive models out there, but it is made with the pro in mind. Constructed out of high-quality stainless steel and insulated deeply, this pizza oven will help make your food taste as though it’s just come from a restaurant kitchen. It takes around 30 minutes to completely cook a pizza using this pizza oven including heating up. 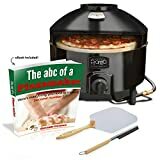 While this may seem a little long in comparison to others out there, once you taste your food, you’ll understand that it’s well worth the wait, and of course, once it’s heated up, you can crank out multiple pizzas quickly. The cooking area of the ilFornino is huge, and it can cook up to four 12″ pizzas at a time. However, as the pizzas need to be constantly rotated, realistically you can cook two 12″ pizzas at once. Another great feature about this pizza oven is that it’s fueled by wood, and can retain its high temperature for longer thanks to two heavy ceramic blankets for insulation. Be sure to get the all-weather cover for this one, as you don’t want to let your hefty investment get damaged by the elements! There’s no denying that food cooked with the ilFornino Professional Series Wood Fired Pizza Oven tastes great, but considering the price of it, you’d expect nothing less. You can also see straight away how incredibly well made this machine is. But is it worth the hefty price tag? Probably not. Especially when the Uuni 3 Portable Pizza Oven will do everything this one will at a fraction of the cost (except cook two pizzas at once). And the assembly of this pizza oven isn’t exactly fun either. So unless you’ve got bottomless pockets and a handyman up your sleeve, as fabulous as it is, you may want to give this pizza oven a swerve. Hopefully, after reading this review you’ll be ready to make your next outdoor kitchen purchase. If you’re unsure, we definitely recommend the Uuni 3 Portable Pizza Oven. It’s not the cheapest model to buy outright, but it does run on wood pellets, meaning it will cost you less in the long run. And it’s so cool looking! If however, Uuni just doesn’t do it for you, be sure to take a peek at the Camp Chef Italia Artisan model. It’s slightly different in that it runs on propane, but still produces beautifully tasting pizzas. Or, if you want to try and save a few pennies, the Pizzacraft Pizzeria Pronto Outdoor Pizza Oven may be more your style. It looks great, is perfect for transporting around, and it doesn’t cost a fortune either!